Another round of Vancouver neighbourhoods are using collective impact to decrease their ecological footprints. Residents in Hastings-Sunrise and Sunset in Vancouver are already making an impact in their communities. These two neighbourhoods are the latest cohort to join Evergreen’s Green Bloc Neighbourhoods program, which fills the gap between individual level and city-level change by asking neighbourhoods to collectively address climate change and resource consumption. The one-year program started with an introductory workshop for both neighbourhoods, led by Evergreen. At this workshop, long-time Green Bloc partner, Dr. Jennie Moore from BCIT’s school of Construction and the Environment presented her research on the Ecological Footprint concept and forms of measurement. With an understanding of the science behind the Ecological Footprint tool, participants took on a one-week survey in their households to measure their food consumption, transportation, energy usage, and waste in the home. They even weighed and separated their waste for the week! Both neighbourhoods are already doing considerably better than the average Canadian. The Earth has the biocapacity for 1.7 gHa (Global Hectares on average) per person globally, but the Canadian average is 8.2 gHA per person. The average ecological footprint for Sunset households was found to be 3.39 gHa, while the Hastings-Sunrise average measured 3.46 gHa. 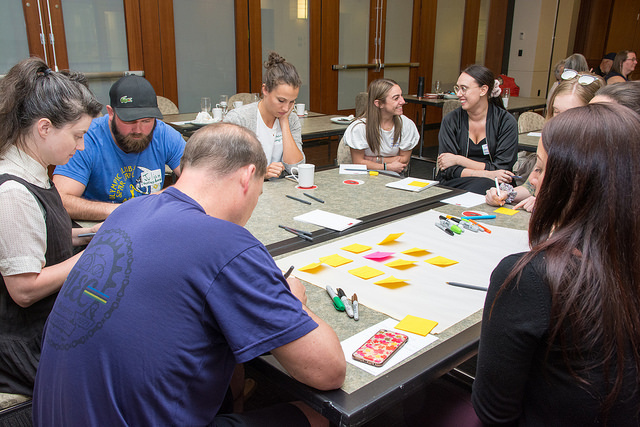 After analyzing the survey data, Evergreen hosted an asset mapping workshop in each neighbourhood to set goals for reducing ecological footprint on a neighbourhood-scale, and identify opportunities in the community for innovation. Which of these practices do you implement at home? In 2017, Evergreen supported four neighbourhoods in the program. These communities achieved an average reduction of their overall ecological footprint of 15 per cent! Through participation in the Green Bloc program, the 2017 neighbourhoods have built capacity and connections within their community. The program culminates with a legacy project, which is a permanent asset in their neighbourhood, and acts as a tribute of their experience in program. Many of the Green Blocs continue their engagement and project development beyond the one-year program facilitated by Evergreen. Evergreen continues to support the neighbourhoods with tools and resources to help them succeed. Can’t wait to see what Hastings Sunrise and Sunset have in store for their projects. Find out more about Green Bloc Neighbourhoods on the program’s website. Thanks to Vancity Credit Union and their Envirofund for sponsoring Green Bloc Neighbourhoods. Our partners in this program include Sitka Foundation, the City of Vancouver, SFU Public Square and One Earth.